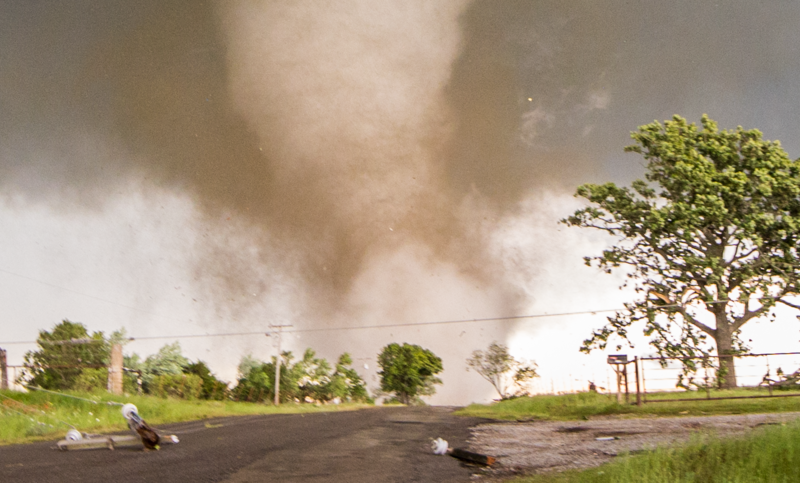 It’s been a while since I have written a blog post, but after the May 9th tornadofest in Oklahoma, the itch to write a chase log and meteorological discussion is overwhelming. There are piles upon piles of data, pictures, and video to look over but I will do my best to narrow them all down to a few key points here. If you follow me on Facebook, you probably already know how much random stuff I post on there. It’s habit, I want to post it here but it always seems more time consuming. 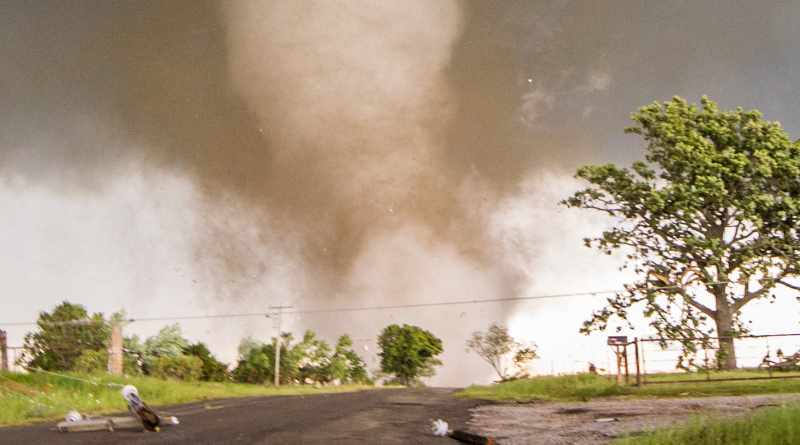 Anyway… Scott and I intercepted a series of tornadoes on May 9th. A violent tornado near Katie, OK, a strong wedge near Sulphur, OK, and a weak tornado in downtown Hugo, OK. This was an incredible chase, and far exceeded expectations. This post is long, so I am holding it to only stuff about the violent tornado and will perhaps add more stuff about the rest of the chase later. An outflow boundary (OFB) left behind from overnight/morning elevated convection is established south of the Red River east of Gainesville, TX. The OFB is not analyzed on the map below, but it is roughly coincident with the southern edge of the precipitation over North Texas. Per mesoanalysis data, a dryline extended from Dodge City SSWwd to near Childress, TX. Note approximate boundary and low locations on the below mesoanalysis map. Note, however, that the observed data from the Oklahoma Mesonet and surface METARS actually show the dryline roughly one county west of its position on mesoanalysis. 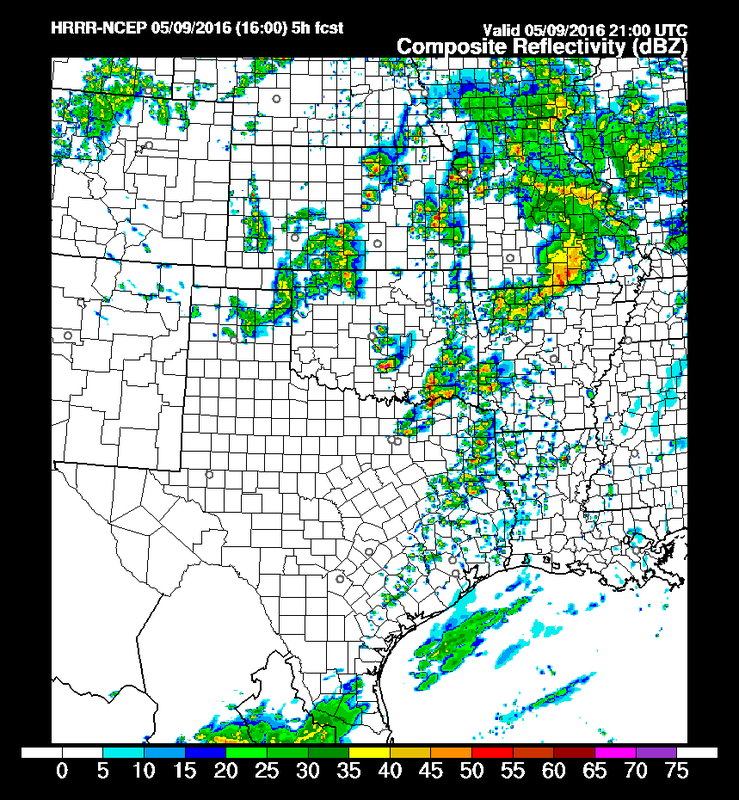 Operational HRRR solutions available at 13z do show small dryline storms in KS and central and northern OK. However, the activity over the unchaseable jungle of far SE OK and far SW AR appears to be more interesting, given the potential for interaction with the aforementioned OFB… to us at least… perhaps. Forecasting is always wrought with uncertainty, and the sheer volume of convective allowing models (CAMs) and operational models in 2016 only appears to confound the problem. It is absolutely vital to assess how models are handling the current state of the atmosphere before relying on them, and it takes tons and tons of practice to pull this off. I know that I need to do better about this honestly, because you’re better off assessing one or two models than trying to use all the CAMs without objectively evaluating them. It is intensely time-consuming work and often there is simply not time for that during a chase. That’s why after drooling over all the pretty images from the NCAR ensemble and the SSEO, I decided to go back to the basics and focus nearly entirely on 1-minute observed visible satellite, surface obs, mesoanalysis, and HRRR. Reducing the information overload helped me focus. Scott and I left Norman, OK around 11am with the intent to target storms along the outflow boundary near the Red River. Initiation along the dryline did appear likely, but we were concerned that, despite ample shear with the well-timed shortwave trough during the early-mid afternoon, low-level SRH would be pathetic in the warm, moist air near/east of the dryline. We wondered whether the SPC’s statement about the rain cooled air/OFB eroding/breaking apart/advecting northward in streamers would prove false. We hoped that the boundary would stay intact allowing for a storm to potentially ride the boundary for what seemed like the only good chance at any unstable surface-based inflow and nice low-level SRH combo during the afternoon. We expected low-level SRH to increase nicely over the Arklatex as the LLJ kicked in during the evening. So our thought was to go down to Gainesville and then east on US-82. Around 17z Scott and I are on I-35 passing near Wynnewood, OK. We note that the HRRR now has a nice-looking supercell practically where we are at 21z. We discuss stopping and waiting there, but are perplexed by the model solution. Low-level winds were relatively weak, and SPC’s mesoscale forecast data from the mesoanalysis page showed SRH quite low during the 20-22z timeframe. The model initiates this cell east of Duncan, OK and we do make note of a cumulus field (cu field) in the right place for this to occur. So although we continue on to Whitesboro, TX we keep a close eye on the environment in S OK and N TX near the dryline. In Whitesboro, we found a Chinese restaurant with 4.5 stars on Google Maps. The sauce was nice and light, and the food was high quality. 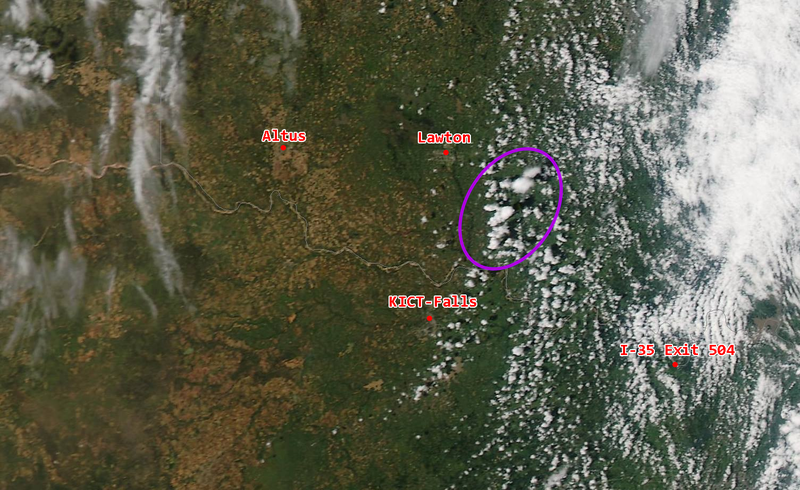 Cumulus around Duncan, OK on 1-minute visible satellite. 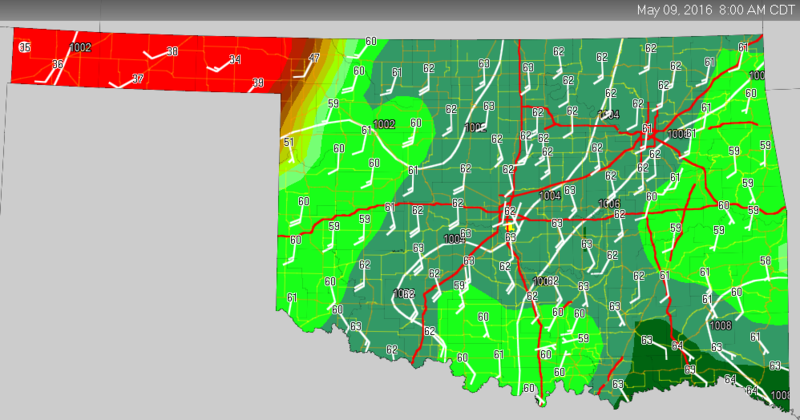 Also note that the air along I-35 in S OK is clearly the cool, stable air from the morning convection. While eating, we closely monitored 1-minute satellite and surface observations as well as mesoanalysis. Between 1900z and 1940z we noticed several things that persuaded us to return northward on I-35. Visible satellite clearly showed the outflow boundary and stable air breaking apart into streamers and advecting northward. This meant that there was no longer any hope for an OFB play. 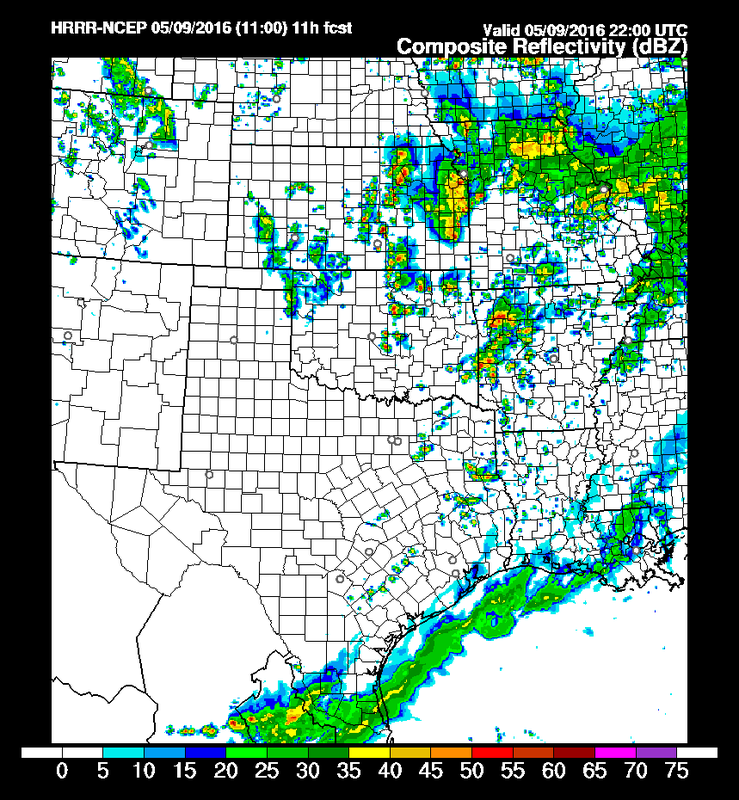 The HRRR remained remarkably persistent in developing an isolated supercell with an intense UH track in S OK. The cell was generally initiating east of Duncan, OK. 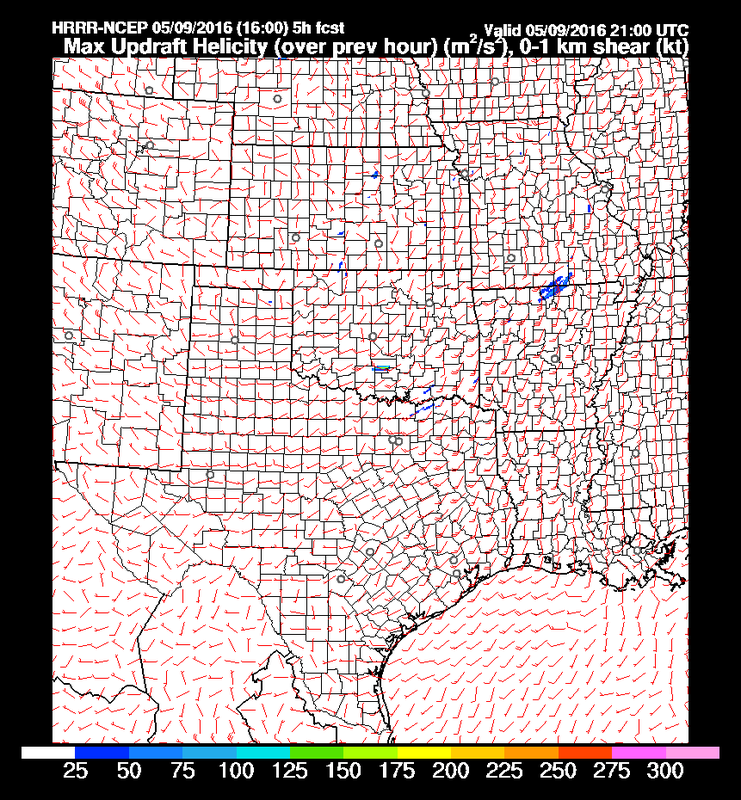 The cu field along the dryline was becoming increasingly agitated exactly where the HRRR showed initiation. (Storms actually initiated before we left Whitesboro). Winds were backing very well across S OK (although they remained weak). The dryline was making a massive arc across OK and TX as it raced eastward, indicative of the substantial upper support overspreading the area. Rich moisture was pooling ahead of the dryline with Tds AOA 70°F along a moisture axis in S OK. The MODIS Aqua polar-orbiting satellite passed over the region at 1910z. Towering cu are circled as initiation begins. It didn’t take long for several cells to go up along the dryline bulge near and north of the Red River. A post-analysis of mesoanalysis and real-time data shows that there was an area of intense surface heating along the Red River to the west of the dryline, where temps maxed out around 90F. I propose that this caused a mesoscale heat-low to form west of the dryline, intensifying baroclinicity along the dryline and contributing to significant surface frontogentic forcing for ascent, leading to initiation. I further propose that this meso-low interacted with high pressure over SE OK/SW AR caused by differential heating due to the persistence of low cloud cover across this area during peak heating, causing winds to back ahead of the dryline in response. (Think flow from high –> low pressure caused by this interaction would be nearly cross-isobaric i.e. an easterly component due to the small spatial/temporal scale). Backing winds advected a moist and strongly unstable airmass ahead of the dryline, and enhanced low-level SRH. As heating of the day progressed, this effect intensified, yielding ESRH AOA 200 J/kg as initiation occurred near 20z. Storm inflow provided a feedback that only served to further increase backed winds and low-level ESRH to AOA 400 J/kg by 21z per mesoanalysis. Well… this is my theory at least and I’m sticking to it for now. Would definitely want to discuss it with others to hear their thoughts as well. You can see, if you loop the satellite images, that the transverse rolls in the more stable air actually bent along an axis with the little dryline bulge by the mesolow. This, to me, verifies that winds were strongly backed due to this feature and were full of globs of glorious SRH. So… as far as the chase went, we didn’t really figure all this out on the fly. We saw the cells going up, they looked great, and we picked the right one. We saw that they were multicellular with obvious rotation as we approached them from the south on I-35. The southern-most storm base was the most beefy, so we kept a close eye on it as we exited I-35 at the Wynnewood exit. We filled up with gas at a Shell station right there while lightning ramped way up (I hate pumping gas while there are a bunch of CGs around for obvious reasons), but we needed it. The first tor warning was issued on perhaps a funnel cloud report by Ben Holcomb at about 2104z (I think). We raced west a couple of miles, popped over a hill and saw the tor about 6 mi to our SW. I erroneously reported tor 2 sw (because I’m a rusty old donk) at 2107z, but at least got to be the first SN report of tor :). The storm and tornado were as classic as you can get. The mammoth updraft displaced all the forward flank precip a clear 4 miles north of the tornado. We dropped south to intercept and there was literally zero in the way of RFD precipitation to our west and around the tornado. We shot close-range footage of the violent elephant trunk for about 15 minutes as it tore across the landscape like a jet engine. The most remarkable thing about it was that the RFD was extremely warm and honestly felt dry (though it’s hard to say for sure, the Tds could have easily been in the 60s). This, I know is often, but not always the case for the most violent tornadoes. There is no doubt in my mind that if this tornado had hit a substantial structure, it would have been rated an EF-5 hands down. Thankfully, it did not do this, though it was still sadly responsible for loss of life. Thanks to Scott Peake’s skills and expertise at safely intercepting tornadoes, I never felt too concerned for safety, but nevertheless was nervous being in such close proximity to the roaring beast. So there is a lot more that I can say about this chase, but I will leave it at this for now, because otherwise I’m never going to finish writing and posting this. I’ll leave you with a video loop of the satellite imagery from May 9th. And perhaps I’ll add radar and mesoanalysis loops in a future blog post. There is plenty more to discuss….